In one generation, the climate of many American cities will experience a noticeable shift. 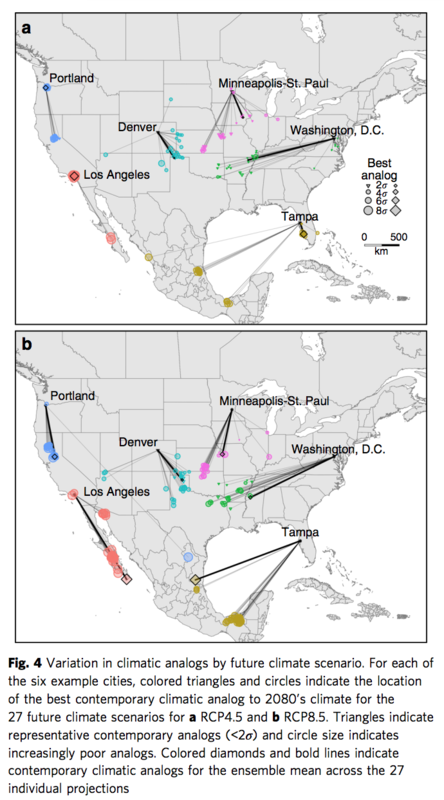 A recent study used climate data, both current and projected, to examine how the climates of North American cities might change over the course of the next generation. In one scenario, the climates of many cities will resemble that of locations about 500 miles away, mostly to the south. The study aims to present the long-term effects of climate change in a personal, tangible way. By 2080, the climate of many American cities will resemble that of locations currently hundreds of miles away, according to new research from the University of Maryland Center for Environmental Science. A recent study — published in Nature Communications — examined 540 urban areas across the U.S. and Canada, and for each compiled current and projected climate data along the measures of minimum and maximum temperature, and seasonal precipitation. For the projected data, the researchers used two hypothetical scenarios: the global community continues unmitigated on its current trajectory, or it enacts measures to contain emissions and, therefore, global warming. The results showed that both scenarios will produce noticeable changes to the climate of many cities, but continuing on the current path will bring more noticeable changes. "Under current high emissions the average urban dweller is going to have to drive more than 500 miles to the south to find a climate like that expected in their home city by 2080," study author Matt Fitzpatrick of the University of Maryland Center for Environmental Science told Phys.org. "Not only is climate changing, but climates that don't presently exist in North America will be prevalent in a lot of urban areas." In the unmitigated scenario (pictured above in section b), the results show that many North American cities will experience climate conditions currently seen in locations about 500 miles away, and mostly to the south. "The climate of cities in the northeast will tend to feel more like the humid subtropical climates typical of parts of the Midwest or southeastern U.S. today — warmer and wetter in all seasons," the University of Maryland Center for Environmental Science wrote on its website. "For instance, Washington, D.C. will feel more like northern Mississippi. The climates of western cities are expected to become more like those of the desert Southwest or southern California — warmer in all seasons, with changes in the amount and seasonal distribution of precipitation. San Francisco's climate will resemble that of Los Angeles." The authors wrote that these kinds of climate analyses are useful because they help frame the projected effects of climate change in ways that are personal and tangible, and less abstract. "It is difficult for individuals to detect and conceptualize gradual changes in climate, particularly where natural variability is high and when expected changes in climate are couched solely in numbers (mean temperatures, precipitation variability, and so forth)," the researchers wrote. "A crucial next step is to join with educators, psychologists, and social scientists to assess the extent to which climate-analog mapping can help increase climate change engagement and awareness." "...our experience of temperature is relative: if you place one hand in hot water and the other in cold water and then put both in a lukewarm bath, you can't tell how warm the bath actually is – your cold hand will feel it as boiling hot, while your hot hand will feel it as soothingly chilly. "So gradual changes in climate are eclipsed by our short-term responses to the weather, which fluctuates every day. We also adapt to long-term changes, so they are harder to notice: you'll immediately jump out of a scalding hot bath, while if you get into a lukewarm one and keep adding hot water, you might not even realise when it's verging on dangerous (if you ignore the rising water levels and rubber ducks in distress). Let that be a warning to the climate sceptics."